For more information contact (713) 639-4737 or ecc@hmns.org. Discover a new world of science as you go behind the scenes with HMNS curators and staff in these exciting, interactive workshops. These programs are for adults only. Each event provides you with ideas and activities to bring your classroom to life! 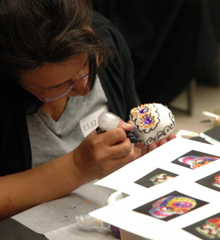 Inspired by the runaway success of the Museum’s Xplorations summer camps and school-year science labs, these workshops give the HMNS teaching staff an opportunity to share what they do best! Stay Tuned! New workshops to be announced soon!